The enterprise software giant wants to analyze multiple data streams to monitor transformer health. It’s not alone. SAP might be best known for its back-office enterprise software, but it’s also branching into the operational side of the smart grid. 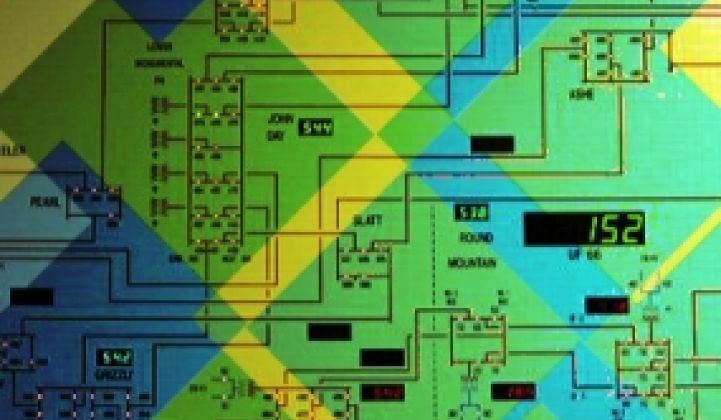 Last week, the German software giant unveiled a new technology platform that seeks to extend its enterprise expertise to a core utility operations task: trying to figure out when power transformers are about to break down, and when to replace them. It’s all part of SAP’s new Grid Infrastructure Analytics suite, which is meant to offer utilities a faster and easier way to get into the world of big data analytics without a years-long, multi-million-dollar IT overhaul. In fact, SAP is promising that it can get its new analytics engine up and running within 7 to 10 weeks, as compared to as many months for a more traditional enterprise-wide IT upgrade. James McClelland, SAP’s senior marketing director for utilities and energy, said that SAP’s new transformer health analytics platform takes in all sorts of data -- weather patterns and local temperature and humidity, voltage and power quality readings levels, internal transformer oil temperature and dissolved gas detection data, etc. -- and combines it to provide a more accurate idea of how well that transformer is performing. SAP already has a big presence in the utility industry, with more than 2,000 customers running its enterprise resource planning (ERP) software, billing and customer service suites, business analytics and other such bread-and-butter back-office systems. It also has a smart meter analytics platform that’s gone to market via its “AMI Lighthouse Council,” a group of industry partners like Landis+Gyr, eMeter, Itron and OSIsoft that together have landed more than 50 utilities, with big clients including BC Hydro and South Korea’s Jeju Island smart grid demonstration project. It’s also involved in “big data” efforts like Southern California Edison’s massive smart grid data analytics project with Itron, IBM and Teradata. For the most part, these projects are focused on bread-and-butter back-office business processes. But SAP’s leap into transformer health monitoring represents a new effort to bring its asset management systems up to the speed of the smart grid. For the most part, utilities lack an integrated way to track and analyze the disparate factors that determine transformer health -- a problem when you’re talking about managing pieces of equipment that can cost tens to hundreds of thousands of dollars to replace, but even more so when they fail unexpectedly. GTM Research’s 2010 utility enterprise IT report has identified some key “gaps” in today’s utility enterprise asset management (EAM) systems and the smart grid. Simply put, EAMs aren’t built to incorporate all the data flowing from these new smart devices, let alone analyze all these disparate data points according to their complex interactions. SAP’s new rapid-deployment, single-issue transformer health module thus represents “a bit of the evolution of the applications landscape,” McClelland said. The model of the past, where utilities had to choose between an entire ERP system or nothing at all, is being replaced by a more modular model, aimed at delivering digestible upgrades that serve specific purposes without breaking the IT budget, he said. SAP is a leader in enterprise asset management for utilities, along with competitors like Oracle, Logica, Ventyx (acquired by ABB) and Maximo (acquired by IBM). No doubt these players are also adapting their utility asset management platforms and products to incorporate the heterogeneous, near-real-time data coming from the smart grid. At the same time, we’ve seen a host of smart grid vendors pitch new and interesting ways to gain similar grid asset health measurements without a full-blown ERP. Smart meter makers including Itron, Silver Spring Networks, Elster and others are promising to provide power measurements to systems that monitor transformer health, and Echelon just launched an app that allows its transformer meters to collect other sensor data to get a clearer picture. Likewise, big smart grid vendors like ABB, Siemens and General Electric are building in more sophisticated asset management into their transformers, while specialist sensor companies like LumaSense are seeking to expand their role in smart grid to broader applications. SAP has done a few acquisitions of its own that it’s incorporating into its new grid analysis platform. Earlier this summer, it acquired Syclo, which develops technology to support enterprise-wide mobile device applications. Not surprisingly, part of SAP’s new transformer health platform includes delivering its analytics to field workers via remote devices. SAP hasn’t named any utility customers of its new grid analytics platform yet, though McClelland said that some customers have tested it and are considering buying it. This isn’t the only part of the grid SAP might want to analyze, either. Other areas it might explore include creating models of energy use for customers and creating energy programs to fit their characteristics, he said.